Senior Advocate Ram Jethmalani, in this short interview to LiveLaw shares his views on Today’s Landmark Judgment which quashed the 99th Constitution Amendment and National Judicial Appointment Commission Act 2015. LiveLaw : Sir, What is your initial reaction to Today’s Judgment? 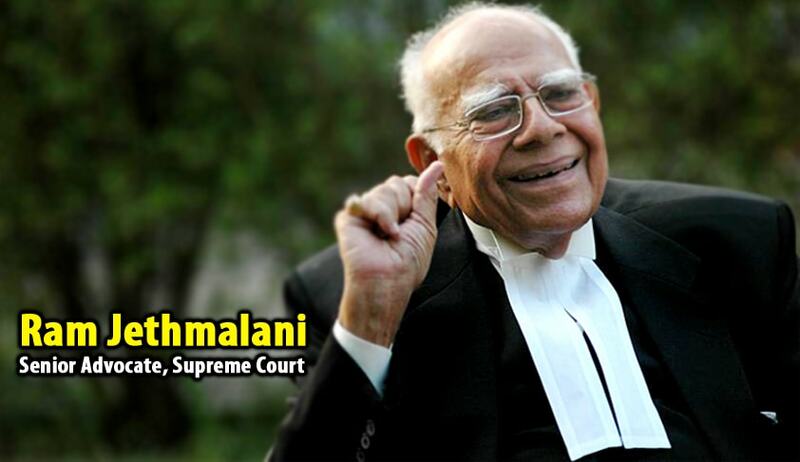 Ram Jethmalani : I think it is a great success for Indian Democracy; the litigating public; the bar and all those who respect honest judges and a clean judicial system. The crooks who want judges to be subordinate to the wishes of prolific litigant namely the government itself must be in mourning. My own view is that in his own interest the PM should get rid of all those law officers who advised and prepared this legislation. LiveLaw : Sir you are the only person who voted against NJAC; Can it be say that you are proved right against two houses of Parliament and about 20 Legislative Assemblies? Ram Jethmalani : No it only means that I and other friends of mine who opposed NJAC, understand the constitution better than Modi's legal advisors. LiveLaw : Do you think the Attorney General and the Law Minister should resign? Ram Jethmalani : I think if they have any self respect they should. The only exception is those who honestly advised against it but were overruled. LiveLaw : Bringing a new law correcting the errors in the NJAC Act or revamping the Collegium system as suggested by the Constitution Bench Today; According to you, which will be better for the system? Ram Jethmalani : The corrections in the Collegium system can be converted into established conventions to be followed by the judges. They should not become legislations. LiveLaw : What is your first suggestion to improve the Collegium System? Ram Jethmalani : A little more of transparency, which should remove suspicion of any factor other than the merit being pout in the scale. LiveLaw : Did the Judgment surprise you sir? Ram Jethmalani : It does not surprise me it pleases me beyond measure. I congratulate my erstwhile junior Advocate Ashish Dixit for his efforts and assistance in the matter.